It's January 2—2016 crept up on me somehow. I'm ready for it although I'm not sure what happened to 2015. The thought of the New Year and all of its festivities felt a bit surreal to me this time around. It feels as though time has been compressed into something of a black hole and I can't tell where one day bleeds into another. I felt this most acutely, perhaps, as my birthday approached. We were already deep into the holiday season—parties and gatherings, cooking and shopping and the writing of cards—and then suddenly it was my birthday, which meant it was almost Christmas Eve and then Christmas. I felt overwhelmed at the thought of it. I had something of an emotional meltdown the night before I started my next trip around the sun. It wasn't pretty. Actually, I'm surprised I didn't have a meltdown much, much sooner. 2015 was, for lack of a better cliché, a roller coaster year. In some ways I feel like I asked for it—or at least predicted it. I remember sometime during that first week of January 2015 thinking to myself, This is going to be a big year. A year of change. A year when things happen. After months of talking about it, we finally started looking for a house in the spring—something that proved all consuming. House-shopping was fun at first and then it was depressing as hell and then it was nerve-wracking and then it was a little bit of fun again and then I thought I might just die from the fun of it all. And then there was the actual physical act of moving. It took us nearly two months to move out of our old place and into the new one. It didn't help that Cory twisted his ankle—badly—the first week we were in the new house. We'd done more than half the move the previous weekend but still had a lot to pack up and drive a few blocks away. The injury set us back and even when we did start again I did everything I could to make sure he stayed off his ankle as much as possible. It was slow going to say the least. Also, we are apparently hoarders, so there's that. Amid it all, we both had to deal with a few work trips (Cory to Florida, me to Salt Lake City) plus a wedding in Portland. The whole spring-summer period was, to say the least, hectic and disorienting. I never want to move again. Still, after everything we went through before with the first house, it felt good to finally call a new house our home. And we love it. The house, the tiny courtyards front and back, our street, our neighbors. The first night in our new home felt like something of a revelation to me. Most of the house was in disarray but Cory had set up the living room as closely as possible to the layout of our old living room and I remember sitting there, physically exhausted and clutching a glass of whiskey and ice, feeling grateful for this new place we were going to call home. This nearly four years to the date from when we'd left our home in Hollywood Park and moved into a rental. Four years isn't much but then again it's a very long time. In all, there was tired contentment and resolution. Then, a few weeks after we moved, I received a phone call from my biological mother in Wichita Falls, Texas. As soon as I saw the missed call on my phone—she called around 9 p.m. CST on a Sunday—I knew something was wrong. She never called that late. She didn't call much at all. We hadn't talked since her birthday in late May--although we'd emailed a few times, I'd sent her pictures of the house. Not talking for that length of time was pretty normal. Pretty good, even. Sometimes we'd gone much longer. My mother left me when I was 2, maybe younger and I didn't see her again until I was 26. The facts surrounding her leaving are unclear, fossilized into myth. It's hard to understand. Even harder to explain. The aftermath of it, however, is that I sought her out after dreaming she had died. My father refuses to talk about her. At least he refused when we were still talking. Now he just refuses to talk to me. In 1996, however, were still on speaking terms but even so I knew he wouldn't be of any assistance, Instead, I asked his sister to help. She did, and swiftly. Within weeks I was on a plane to meet my mother for the first time since I was a baby. Nearly 20 years later we had something of a tenuous, complicated relationship that was a little stiff and formal at times. After my last visit to her, in November 2014, I wondered whether I'd ever even return again. Now Pamala was on the phone telling me that the cancer she'd been battling for five years was terminal. She'd stopped all treatment and instead had hospice workers visiting her a few times a week. She tried to sound upbeat about it as she told me—"It's not so bad! They're very nice. "—but her voice trembled and I could tell she was holding back a sob. A few weeks later she was admitted to a hospice care center and I was on a pre-dawn flight to Dallas that was followed by a three-hour drive to Wichita Falls. I spent just over a week there, driving a loop between my motel and the hospice care center. Eight days. 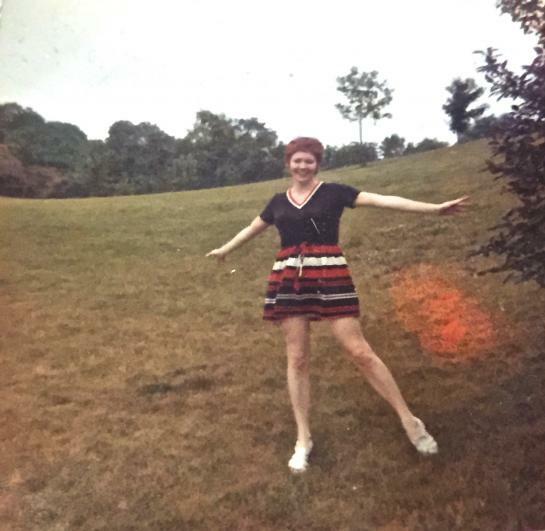 Eight days in which I got to know my mother better than I had in the 20 years prior. We talked for hours until she was too tired to talk anymore. I spent hours with my stepfather, discussing the nature of dying and shared memories and reassuring one another that it was OK to be sad. I spent a lot of that time alone, too. Holed up in my motel room watching hours of HGTV. Sometimes just crying. I took a few drives through the North Texas countryside, listening to the same playlist on repeat through my phone patched into the rental's stereo system. I tried to busy myself with all the writing and editing I still needed to do for work. That at least gave me some focus. I visited the same grocery store every day, buying the same damn salad on nearly every trip. Once, I wasted an hour pushing a cart aimlessly around Walmart, loading it up with snacks and magazines and cheap make-up. I whiled away many hours thinking of new things to ask her and wondering what it means to lose something you're not sure you ever really had to begin with. I wouldn't trade any of that experience for anything. Except to have her back again, of course. Back with all the messy, complications. She died a week-and-a-half after I returned to California. That's not the end of the story, of course. After her death I didn't really want to talk about it much, mostly because I'm still making sense of it myself. Grief is a strange angel. It comes in waves that sometimes feel slight and other times threaten to drown. It changes you. Which is, of course, the most obvious thing I could proclaim. Cheap and obvious. But true. The loss of Pamala—a woman I never called 'mother'—has changed my relationships with the people most important to me: My husband who stood as rock for me during one of the hardest times in my life. With my good friends who sent texts and called and let me cry freely. In particular it changed my relationship with the woman who adopted me when I was four, the person I have thought of as my mother ever since. The person who offered to fly with me to Texas on this trip and spent hours on the phone with me, offering comfort and sharing tears. All of this is just a drawn-out, overwrought way of trying to say that 2015 was a big one. A year when things happened. There was also a wonderful birth--my niece Scout--and the threat of dire illness with a dear family member. In all it was a year of such change that the effects of such are still not fully known. They may never be. Now it's 2016, whether it actually feels like it (it doesn't, at least not yet). So far I haven't had a sense that anything big is looming in the months ahead. Maybe there's no such thing about being in tune with such feelings and predictions. Whatever the case I'm hoping that the next 12 months simply bring a continued sense of home and comfort among friends and loved ones. Any other goals or expectations at this point are secondary, superfluous even. Here's to 2016 and whatever it brings--I hope it's a good one for all of you.